Corporatism and Superdelegates favor the Democratic Party establishment in 2016. Do they win the battle and lose the war? By John Walsh – 4:00 pm Chicago time, April 27, 2016. Despite the corporate media’s unabashed favoritism for Hillary Clinton when reporting the news – it reminds me of the Cold War days when Americans were told about the partisan propaganda at Pravda (a frightening journalistic prospect should it ever arrive in some form to America I always believed) – the delegate count from last night’s five primaries (4 closed and 1 hybrid) comes down to this: a net gain of 52 PLEDGED delegates for Hillary Clinton over Bernie Sanders– or around 2% of the total needed to reach the magic number of 2383 to become the Democratic presidential nominee. Today Bernie Sanders has 1299 PLEDGED delegates and Hillary Clinton has 1632 PLEDGED delegates. Neither candidate can likely reach 2383 – that is, not without the party hacks called SUPERdelegates of which Clinton today has 519 and Sanders has 39. It should be well known that the Democratic Party’s nominating process as it is presently constituted is a corrupt system, rigged, drunk with big money and worship of the status quo, and that its special category SUPERdelegates have flocked and will likely stay flocked to Clinton because they are birds of a feather. The SUPERdelegates’ reasons to support Clinton transcend her qualifications and whether or not she can win these primaries outright under present rules deemed fair. In Connecticut’s closed primary last night, for instance, Clinton won a net gain of 2 PLEDGED delegates over Sanders based on the people’s vote in that contest but she also received an additional 15 SUPERdelegates there (Bernie picked up zero in the state). In Connecticut Hillary won over 170,000 votes to gain 27 PLEDGED delegates and Sanders won over 153,000 votes to gain 25 PLEDGED delegates – or about 6,300 voters per delegate. Yet Clinton picked up those additional 15 SUPERdelegates cast by 15 fellow Americans whose vote, in this case, has a power equivalent to a bloc of 95,000 ordinary Connecticut voters and, further, basically ginned up the Clinton vote by almost 50%. This sort of election process doesn’t take seriously the enshrined “one man, one vote” rule but is a hybrid of the ordinary voter and a handful of royalty voters who can beknight a candidate and the happy few in the voter pool who agree with them. This Clinton delegate lead and the thought police at the corporate media reporting that she is the “presumptive nominee” is part chimera as it is based very much on the SUPERdelegate regime for which no other quality is required except to be somehow part of an establishment clique. Democratic Party – my foot. Bernie Sanders in West Virginia where he has a 30-point lead in ordinary voter polls over Hillary Clinton for the May 10, 2016 primary. Yet they have so far split the number of pledged SUPERdelegates though no votes have been counted. Hillary Clinton in Philadelphia where on April 26, 2016 she won in that state’s primary by 20% in the popular vote over Sanders but won by 1,800% in the SUPERdelegates vote. It may be expected that in states where Hillary won the popular vote and most of the PLEDGED delegates that she might pick up more of these brazen SUPERdelegates. Yet this was not the case in 2016 in New Hampshire, Colorado, Minnesota, Oklahoma, Maine, “Dems Abroad,” Michigan, Utah, Alaska, Hawaii, Washington, Wisconsin, and Rhode Island. In these 12 states (and one constituency) it was Bernie Sanders who won the popular vote and the most PLEDGED delegates but Clinton who picked up all or most of the SUPERdelegates – an additional 77 of them in fact. In a nomination process for president based on delegate count – which delegates? – this kind of system appears (is) “rigged.” Voting results in other states exacerbates this perception of politburo-like favoritism inherent in the DNC and its SUPERdelegate regime – namely, that when Clinton won the popular vote and most PLEDGED delegates she also still gained all or most of the SUPERdelegates. What gives, America? In all of last night’s five primary states, Clinton picked up 63 SUPERdelegates and Bernie picked up one (in Maryland, a state he lost). Bernie won over 1.1 million votes for his one SUPERdelegate and Clinton won about 27,000 votes for each of hers. SUPERdelegates are where the action is! If this is the manner in which the Dems nominate their party’s presidential candidate I may have to think twice about voting for that person in the general election. Unfortunately, it is likely some or all of these wildly unfair SUPERdelegates will facilitate the nomination of either Sanders or Clinton unless one of those candidates achieves the magic number of 2383 in PLEDGED delegates. This is a worthy goal which still remains possible – especially for Clinton. There are 1209 PLEDGED delegates on the table in the final 14 contests and a much smaller indeterminate number of UNPLEDGED delegates (about 195). Based on PLEDGED delegates, Hillary would need to win from this point onward 751 of them (62%) and Sanders 1084 of them (89%) – high, and, impossibly high electoral numbers for each – in order to secure 2383 in PLEDGED delegates. Hillary’s challenge to go into the convention with enough PLEDGED delegates has an outside hope of being realistically achievable but it remains likely she will need SUPERdelegates to put her over the top as the party’s standard bearer. So, if an incomplete slate of PLEDGED delegates is all that one needs, why not nominate Bernie? Under this arcane and untrustworthy convention system, Hillary appears to hold most of the political insider cards. Sanders can fight on and hope to bargain for platform items but the Clinton people will be looking over his shoulder to his voters. How many of Bernie’s voters do they need to win the general election in November? From that point, deals will be crafted. If Clintonites can peel off enough Bernie voters outright with corporate media-driven stories about party unity and fear mongering over Donald Trump, then the Clinton-Sanders deal may be weaker. But if enough Bernie supporters getting on board is problematic –if they clamor for Sanders to be the nominee or on the ticket, or that their political beliefs be incorporated into the 2016 Democratic Party platform on campaign finance reform, breaking up the big banks, free public university education, universal medical insurance, a fracking ban, a $15 minimum wage, etc.– all positions spurned by Clinton and her voters – then things could get hugely interesting in Philadelphia in July. By the way, for each of the 14 upcoming primary contests – from Indiana on May 3 to Washington, D.C. on June 14 – Clinton already has 106 SUPERdelegates committed to her candidacy (Bernie has 8). Not a single vote by the people has been counted in any of those places. It’s rigged. Welcome to the party. 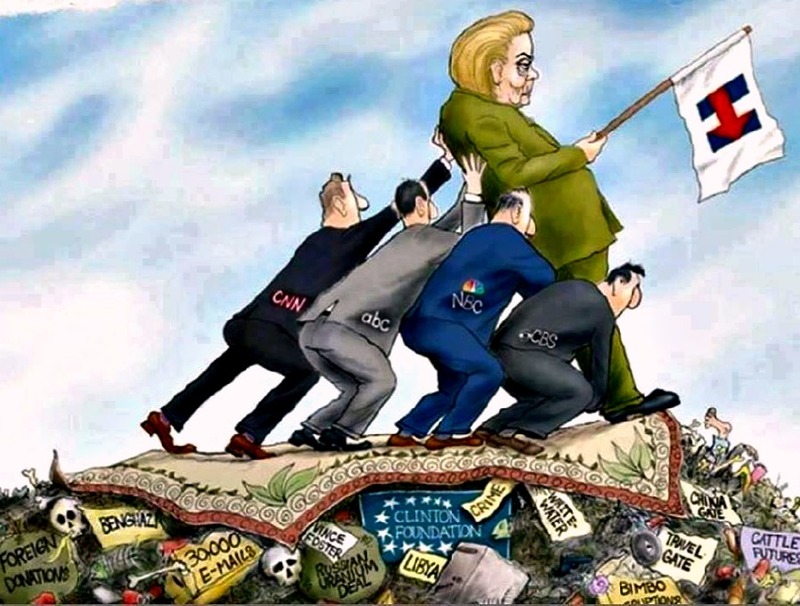 Corporate media propping up the big money candidate. This entry was posted in Current Affairs and tagged Bernie Sanders, Democratic Party, Democratic party primaries, Election of 2016, Hillary Clinton, Superdelegates on April 27, 2016 by jwalsh2013.